Millet, gelatin (capsule), magnesium stearate. Garlicin, alliinaise-rich garlic powder, Magnesium Stearate, Millet, Rose Hips. Millet, gelatin (capsule), and magnesium stearate. 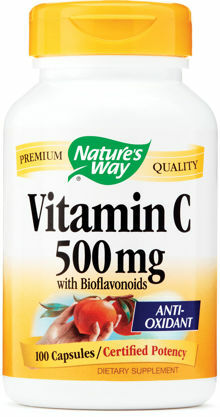 100 % natural ascorbic acid Vitamin C blended with a unique group of citrus bioflavonoids. Vitamin C provides antioxidant protection for many of the body's' important enzyme systems. White blood cells utilize Vitamin C to help produce cytotoxic enzymes which they use to eliminate foreign matter. It also helps strengthen collagen, a major connective protein. Vitamin C also plays an important role in the P450 enzyme detoxification system. Take two capsules as needed, preferably with food.